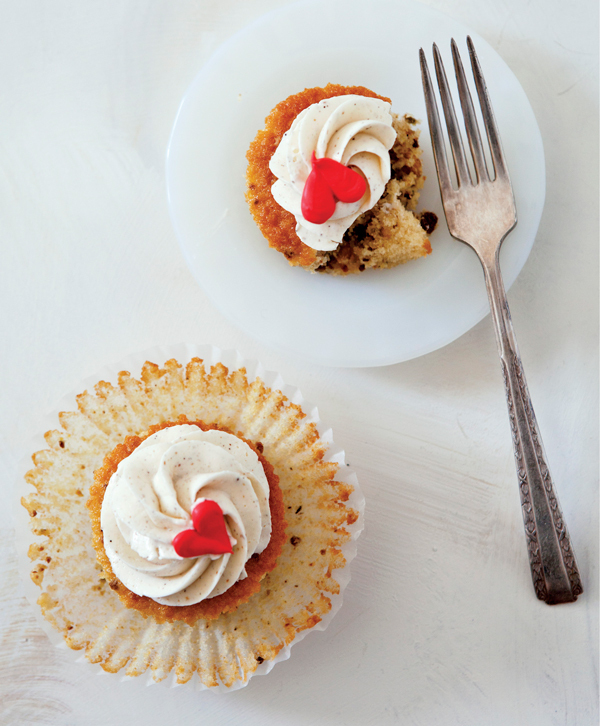 Do you long to bake (and enjoy) delicious gluten-free treats? Sweet Cravings, by Kyra Bussanich, is what you need to guide you through creating sweet treats. Consider this cookbook a gluten-free baking resource. Not so that you can make gluten-free desserts that are “OK,” or close to the “real thing,” but for making irresistible — and gluten-free — cupcakes, scones, tarts and cakes. Kyra Bussanich is a trained chef who found her own way to make delectable gluten-free goodies. She attended Le Cordon Bleu’s patisserie and baking program, and worked after classes to experiment in creating gluten-free pastries. Initially, she developed several tasty cakes and shared them with her friends. Word spread and she began baking gluten-free goodies as a custom-order business. She eventually found herself on the Food Network’s Cupcake Wars, and now bears the title of the first gluten-free baker to have won a competition. Kyra moved on to create a successful bakery where her goodies wow her customers. Get ready to drool as you flip through the book’s pages. Over and over, you’ll come across gorgeous goodies that you’ll want to bite into, dunk in hot coffee or swipe a smidge of frosting from. Each recipe has a gluten-free flour blend formulated specifically for the type of pastry: one blend for scones, another for cakes and yet another for cookies. Where appropriate, Kyra suggests an “all-in-one” gluten-free baking mix as a shortcut. The book includes a guide to ingredients and how to make adjustments, as well as tips and chef secrets for baking. You will impress all who eat these treats, whether they follow a gluten-free diet or not. When I was in my mid-20s, I studied tribal belly dancing. There was always incense burning at the studio, and I would return home each day smelling of a mysterious aroma. I was inspired to create these alluring cupcakes, with the spicy redolence of cardamom, sweet nuttiness of pistachios, and butteriness of saffron. Since gluten-free baking can be pricey enough, I’ve eliminated the saffron here. If you wish to use it, simply add the saffron threads to the butter in the first step of mixing. You don’t need more than 1/4 teaspoon. If you want to try making the little heart decorations shown in the photograph, simply tint a bit of the buttercream red and pipe it into a V shape for a cute accent! Preheat the oven to 350 degrees F. Line two 12-cup muffin pans with paper liners (enough for 20 cupcakes) and set aside. Measure the pistachios, rice flour, starches, baking powder, cardamom, xanthan gum and salt into the bowl of a food processor and pulse until the pistachios are finely ground. Using a stand mixer with a paddle attachment, cream the butter on high speed until light and fluffy. Cream in the sugar until the mixture is several shades lighter and very fluffy. Add the eggs, one at a time, and blend thoroughly, stopping after each addition to scrape down the sides of the bowl. Add the vanilla to the milk. Add the dry ingredients to the butter mixture in 3 additions, alternating with the milk mixture, and blend thoroughly after each addition, stopping occasionally to scrape down the sides of the bowl. Evenly fill the cupcake liners two-thirds full and bake until a toothpick inserted in the center comes out clean, 14 to 18 minutes. Remove from the oven and place each cupcake on a cooling rack until completely cool. Stir together the sugar and water in a small saucepan. Wipe down the sides of the pan with a wet pastry brush to ensure that no sugar crystals get in the syrup. Heat until boiling and a candy thermometer registers 248 degrees F, about 10 minutes. Meanwhile, switching the mixer to a whip attachment, beat the egg whites and cream of tartar on high speed to the soft peak stage. On medium speed, very slowly pour in the hot sugar syrup. Turn to high and whip until the bowl no longer feels warm to the touch. Add the butter in chunks and mix until fully incorporated, stopping occasionally to scrape down the sides of the bowl. Slowly blend in the vanilla and cardamom. Frost the cooled cupcakes with the buttercream and enjoy! 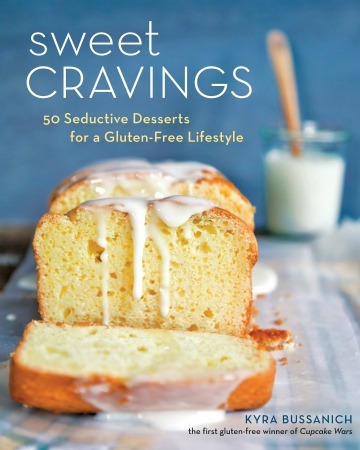 Reprinted with permission from Sweet Cravings: 50 Seductive Desserts for a Gluten-Free Lifestyle by Kyra Bussanich (Ten Speed Press, © 2013). Photo Credit: Leela Cyd. Kyra Bussanich graduated from Le Cordon Bleu’s patisserie and baking program and worked as the assistant pastry chef at clarklewis in Portland, Oregon, before founding her own award-winning gluten-free bakery, Kyra’s Bake Shop (formerly Crave Bake Shop). She was the first gluten-free baker to not only appear on — but win — the Food Network’s Cupcake Wars. She was also runner-up in the all-star series Cupcake Champions. Kyra and her shop have been featured on the Today show, Fox News, the Food Network, Food & Wine, USA Today, and the Huffington Post among others. She lives with her husband in Portland.